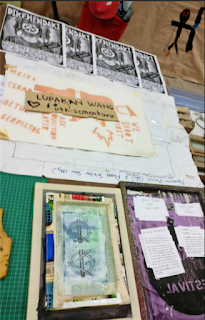 After two visits to Balai Seni Negara, and one sojourn at Universiti Malaya's Piyadasa Gallery, there is much to ponder about the inaugural Kuala Lumpur Biennale. Beyond the initial disappointment of navigating a terrible website, arriving at empty galleries and a broken elevator, I have since encountered thoughtful installations and great individual artworks, and a couple effective arrangements befitting its cheesy theme. It is unfortunate, yet unsurprising, that the first note on this five-months event is about (self)-censorship. One day before its official opening, news portal The Malaysian Insight reports that Aisyah Baharuddin has chosen to cover 'Under Construction' in black netting, due to the removal of certain components in her (and her collaborators') installation by authorities. A police investigation pertaining to this matter is ongoing. 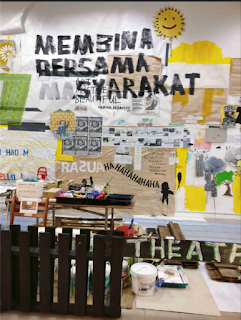 Occupying a long floor space on the second floor, visitors walking up the circular path are greeted with decorated tongs filled with recyclable stuff, while a dark banner hanging above shows a photograph of a balustrade wall with the stencil-sprayed letters "saya berjanji tidak akan membuang sampah merata rata". One placard describes the mixed media installation (and documentation), as a collection of stuff belonging to Pusat Sekitar Seni and Population Project. Wall texts further introduce the former collective, as an active community that encourages environmental awareness, through art activities involving children participation. Surrounded with low wooden fencing, patterned straw mats and tarpaulin sheets cover the exhibit's floor area, while photographs, a television, false doors & windows, posters & banners, quotes & slogans, cover the wall. Cardboard cut-outs of comic characters, paintings on paper, and colorful patchwork denote children's input. A poignant poem about social media use, titled Aku, is scrawled in red ink on scrap paper pasted onto the wall. 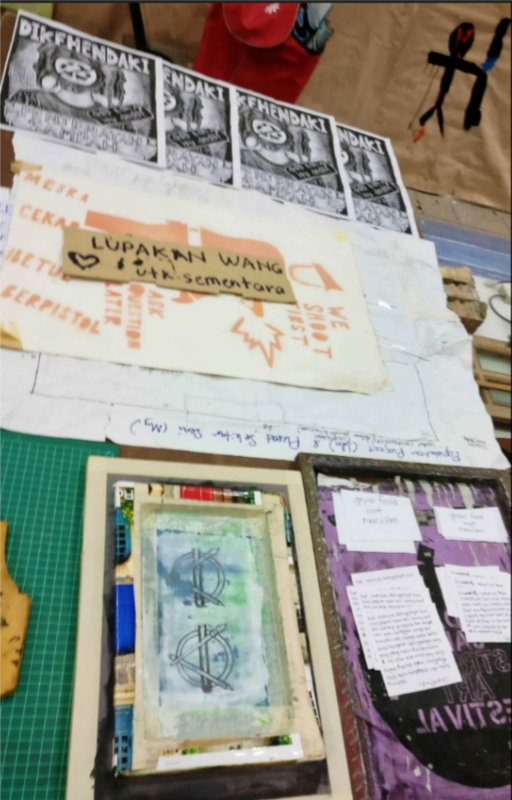 Slogans and prints indicate the activist practice of the collectives' organizers; Texts spotted include "Bebaskan Hak Berorganisasi", "Rasuahahahahahaha", "grow food not racism", and "Mesra, Cekap, Betul, Berpistol". The accumulation of furnishing and household stuff, and its DIY presentation, portray a vibrant community and egalitarian spirit. 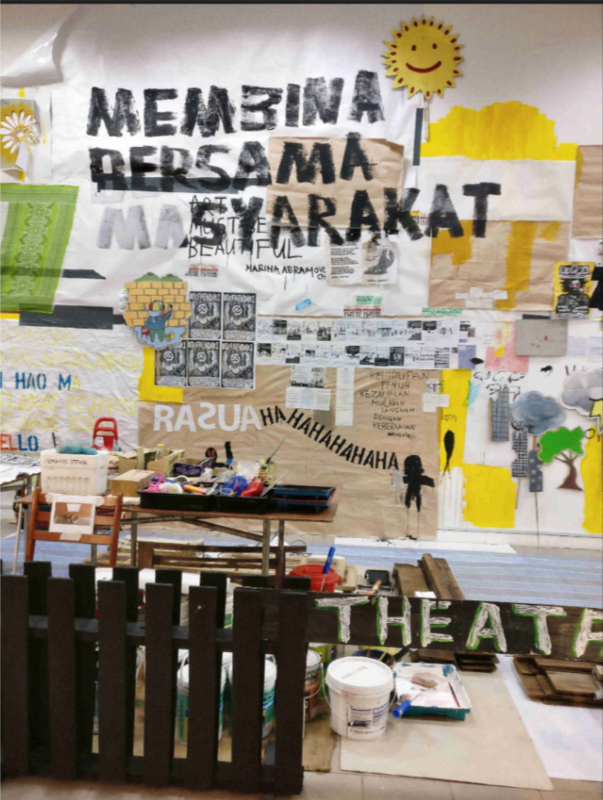 This is a delightful installation that presents a breathing space between two enclosed galleries, and its main slogan "Membina Bersama Masyrakat" falls neatly into the exhibition theme "Belas Insan". Nine months after Samsudin Wahab's mural is painted over, and eight months removed from the Pangrok Sulap controversy, this incident of censorship occurs at Balai again. Miscommunication is apparent; Questions abound - what was the exact complaint about? Who physically removed the exhibits deemed offensive? When were the police involved? Why were the artists not allowed to continue work on their installation? Did the curator/organizer overstep their authority? Who exactly uttered the Communist description? How much truth was conveyed to the artists, who then reacted with a gesture of protest? 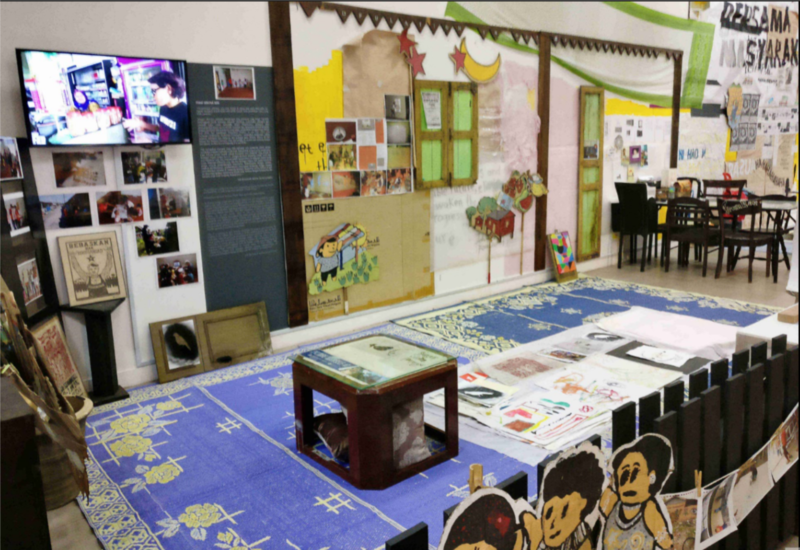 Previous episodes of censorship in Malaysian visual arts have informed, that taking sides at the outset of such incidents, is an unproductive reaction. Especially when I am relying on information, relayed only by two reports by the same journalist, on the same news portal. This source had not named the curator involved, or gotten a response, even. Being told that you are loved, when you are actually not? An inauspicious beginning, indeed. "Who is the custodian of the artworks in any art exhibition? 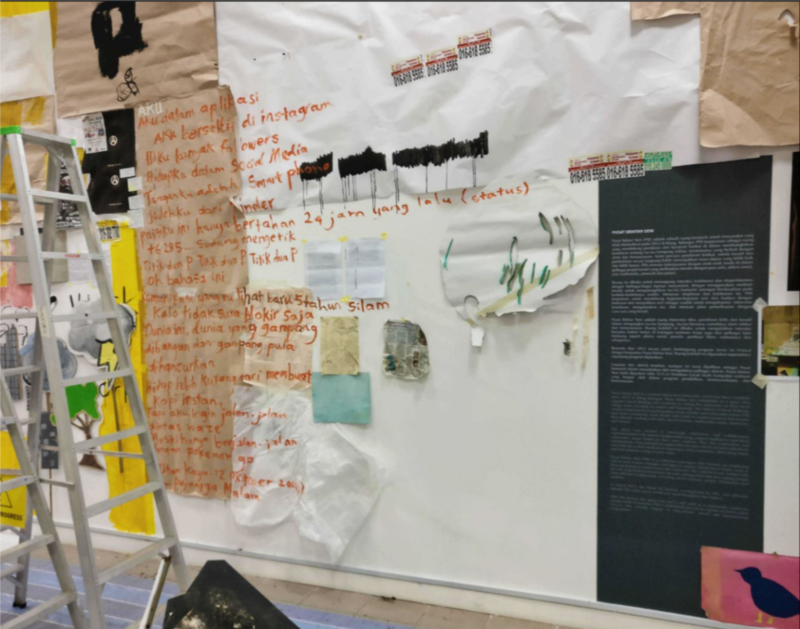 What is the role and responsibility of a curator and/or co-curators in relation to the exhibition, the organizers, the artists, the artworks and the public? If there is a complaint about an artwork or artist, what is the standard operating procedure (SOP) to deal with such a complaint? Who devised the SOP and in whose interest? If there is no SOP then why is there none? Who benefits from and who is disadvantaged by the presence or absence of a SOP? Who has the authority to remove a work and under what circumstances would this authority be exercised? Are there checks and balances to ensure there are limits to this authority? Who would serve as a credible check and balance and to what end? In my view, until some of these questions are addressed in an open, honest, consultative and deliberative manner, we will never escape the C and perhaps, we never should."